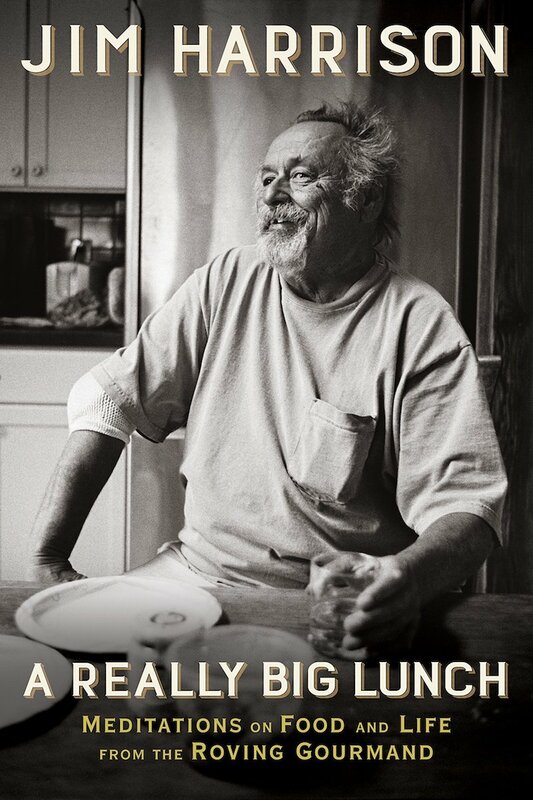 A collection of exuberant food writing and meditations on life from the late, great Jim Harrison. In A Really Big Lunch, Harrison directly addresses some of his favorite topics, dropping much of the lyricism from his prose, to write at his most fun. Like a discoverer with the pirate flag flying from his mast, he is excited to share the secrets of his loot. Even when he is operating in full wine snob mode, he is a joy to read ... The intimacy and enthusiasm of Harrison’s food correspondent style makes reading A Really Big Lunch feel like sitting at a table during a really big lunch with the best, and smartest, and most entertaining of friends ... almost a radical manifesto for Epicurean hedonism; an argument for a feast, in every sense, against the teetotalers bragging about the length of their hunger strike ... He manages to convince, with nearly every sentence, that the worst sin and most offensive crime is to leave anything left on the plate when it is time to leave the table. A Really Big Lunch, whose publication marks the first anniversary of Harrison's death, brings him roaring to the page again in all his unapologetic immoderacy, with spicy bon mots and salty language augmented by family photographs ... Harrison's writing is pungent. He's often a hoot, though frequently exhausting, too. Writers, he says, 'are isolated stockbrokers of life's essences, and it is always 1929.' Preferring to mince garlic rather than words, he's scathing on American politics ('fraught with acute mental dysentery'), publishing ('that Walmart of words'), and the 'bliss ninnies' or 'body-Nazis' who cotton to what he calls the 'Gandhi diet' ... Reading this book straight through is not advised, unless you have the stamina of those gourmands at the really big lunch. But snacking on classic Harrisonisms like 'I've never been the man I used to be' is deliciously filling. Get this. That’s my earnest advice. If you merely have a passing interest in the revolution in food writing of the past 50 years, you need to know about the most macho food writer of them all ... Harrison will quickly tell you he loves to kill what he eats and interrupt marathon meals to dip into 'vials of white powder to stay awake.' All this orgiastic machismo is interlarded with philosophy. 'It has only just occurred to me that I might not be allowed to eat after I die.' The obvious thing to say here is that only two or three (or four at most) of these essays at a sitting are recommended, lest readerly dyspepsia graduate into something like a coma from culinary prose. In sensible portions, he is the best cure for nouvelle cuisine prose ever. What did you think of A Really Big Lunch?